How to insert macros in Outlook 2013 messages? I understood that I can use Macros in order to automate worksheet processing on Microsoft Excel. In Outlook I am looking for a similar capability in order to automate a data import from Excel into my Outlook message. For some reason I don’t see a way to Record Macros button as I can see in Word documents and Excel worksheets. Any idea how to enable macros on Outlook? Thanks Dayton. As you pointed our correctly, creating macros by simply recording them is available on Word and Excel, but not on other Office applications such as Outlook (as well as PowerPoint, OneNote, Project). Your safest choice would be to leverage Visual Basic for applications for writing your Macros. You’’ first need to enable the developer tab, and then write your own Macros using the VBA (Visual Basic for Applications) editor. Getting started with VBA is not easy, but MSDN has a great tutorial to get you through the basic of VBA for Outlook. How to automatically receive email in Outlook 2013? I am using Outlook 2013 to read my Hotmail. The thing is that by default, Outlook refreshes my inbox every hour or so. Is there a way to make Outlook automatically refresh every 5 minutes or less? Open Outlook 2013 and ensure that you are in the Mail tab. From the upper menu, select Send/Receive. Select Send / Receive groups and hit Define a Send /Receive group. Ensure the interval is not too short or you’ll end up with duplicated messages in your mailbox. Hit Close, and you’ll be all set. Additional Outlook questions? Look into our guide on how to get your questions answered. How to make a .pst file in Microsoft Outlook 2013? The other day, a friend that runs Outlook 2013, was inquiring about storing his personal data in offline Outlook personal folders. We typically refer to these files as PST files. They are useful for storing all correspondence related to a particular subject in a separate folder offline, so searching and retrieval when offline will be easy. Follow the steps given below to create pst files in Microsoft Outlook 2013. Under Home tab, select New Items. Select More Items in the drop down and choose Outlook Data File. Browse the location where you would like to store the pst file. Enter a name for the file and click on OK.
From time to time you would like to backup your PST files to an external device or network folder. For increased security you might want to password protect your PST file. You are free to use as many PST files as needed. This will come handy to sort email related to specific people, projects or time frame. Make sure one of them is set as default. You can also create sub-folders under the existing Outlook file, by selecting New Folder in the drop down obtained by right clicking on the psd file in Outlook. How to modify your Hotmail password in Windows, Android phone, iPhone or iPad? Applicable to: Outlook.com on Windows (7,8,10), Android and IOS computers, as well as Apple Mail and other 3rd party mail apps on IOS. I would like to change the Hotmail password in my computer. I also own a nice Galaxy Android phone which runs the Outlook.com application. Could you provide some information about how can i modify my account login info without losing access to my inbox, which is critical for me. Few years ago, Microsoft re-branded their Hotmail web email service and introduced Outlook.com.Still many of us stick to our beloved Hotmail email address, when using Outlook.com. With the increasing amount of attempts to hijack web email accounts, it’s a good practice to modify your credentials every couple months. In this post we’ll answer our reader question, and provide additional information aimed at covering Hotmail login info changes in Windows and iOS devices. Important Note for Android users: As of February 2019, The Outlook.com app on mobile still doesn’t support Microsoft account login password modification and resets. Hence you should first modify your credentials from the Outlook.com site which you can easily access from your device browser (Edge, IE, Firefox, Chrome, Safari). The entire process is detailed in the next section. In this section we’ll learn how you can replace your Microsoft credentials. Please be aware that the Microsoft account password is needed not only for Hotmail, but also for Skype, Microsoft Office 365 online and other Microsoft web services. If this is your first attempt to modify your access credentials, good chances that Microsoft will require to verify your identity by sending a security code to additional mailboxes (by email) or cellular phones (by SMS) that you have provided during your account setup process. First off, from your favorite web browser, login to the Outlook.com website and access your mailbox. Then, on the right hand side, hit your user icon. Now, in the Your Info area, hit Change password. Next enter your current credentials and your new ones as shown below. Back in your mailbox you’ll receive a new incoming message confirming your credentials modification. A couple of readers have asked on what should they do in case that they simply don’t remember their Hotmail login credentials. In that case, you’ll need to reset your password from the Outlook.com login page. You’ll be prompted to enter your new password. Once you do, hit on Sign In and start using Outlook. The way to modify your Outlook.com password for IOS depends in which app you’ll be using for accessing your Outlook email. On your iPad or iPhone hit the Microsoft Outlook icon. If prompted, change your password. Start using Outlook as usual! Access the default Apple Mail application. Go to your Outlook.com mailbox. The mailbox will sync up automatically, and you shouldn’t be prompted to change your login details. First off, if you are still running the legacy Hotmail app for some reason, consider upgrading, as Outlook.com has much better usability and features. If you opt to continue using your Hotmail app, follow the steps below to change your password in Android phones and Apple devices. Open your email app and press the Menu button and select More. Then, choose Incoming Settings from the list of options. Enter your new password in the Password field and click on Next. Open Settings from the list of icons in the Home. Search for Mail, Contacts, Calendars and tap on it. The accounts that are accessed via the devices are listed. Choose Hotmail from the list. Touch Account in the page that opens. Modify the password in the Password field and press Done. Where to find Scanpst.exe file in Outlook 2010? My Outlook profile file (.pst) is corrupted, and I read somewhere that I can scan and repair it using scanpst.exe tool. However I can’t find it in Microsoft Outlook 2010. Where do I look for it? Thanks for the question. As you have rightly said, the Scanpst.exe scans your corrupted Outlook profile and tries to repair it. While Scanpst.exe does ship by default with Outlook 2010, it cannot be accessed from within Outlook. In fact, you cannot even run this utility without closing Outlook. Once you’ve completely exited Outlook, open My Computer and go to Files\Microsoft Office\Office14, and you will find Scanpst.exe there. How to view your Google Calendar in Outlook 2019 / 365 ? I am right now in the process of installing Outlook 365 software on my new computer. I also use a web version Google Calendar to manage my personal calendar. 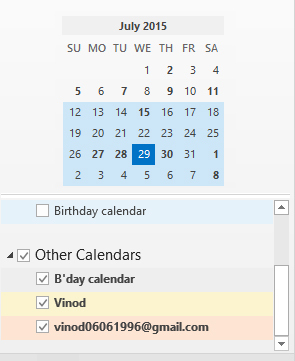 Probably a great idea to use Outlook to access both calendars? If so, i would like to ask you if there is a way to view Google calendar in Outlook and probably keep them in Sync? Thanks for the question. Keeping your schedules in sync might be quite challenging if using several calendar management tools. In this post, we would like to cover the most common use case of Outlook users, which is a one direction access between Outlook and Google (Outlook becomes the one-stop solution to access your meetings/appointments entries; but you can continue to update your Google Calendar as you see fit, as those will be synced into Outlook. Log into your Google Account, Open Google Calendar. In My calendar list, select the particular calendar drop down box and click Calendar Settings. Select ICAL in the Private Address. Copy your ICAL link (hit Control + C) . Now hit Enter. Now select Account Settings again. Navigate to the Internet Calendars section. 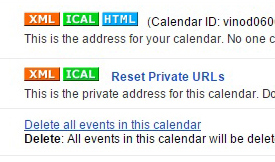 Now paste (hit Control + D) the URL of your Google Internet Calendar that you previously copied. Click Open Calendar, browse to the your calendar file. Done! your calendar is now visible in Outlook. Note: Support for Internet Calendar is still not available as of Outlook 2019 for MAC OS X. This freely available sync tool allows you to sync your calendars. Note that both one or bi directional updates are available. Support for Office 2019 seems not available at this point. Using Microsoft Flow, you are able to set up an ongoing sync between GMail calendar and Outlook.com (which you are able to easily access via Outlook 365/2019). The caveat here is that you’ll need Outlook.com to sync up the accounts. Questions? Feel free to leave us a comment.